It’s exciting to find treasures as you amble along the beach but did you know that shells, rocks and sea glass are just as much fun to paint? In this class you can learn how to paint the sea’s edge complete with foam. You will choose to paint a smooth sand beach or sand that looks so real you’ll have to stop people from touching your painting. 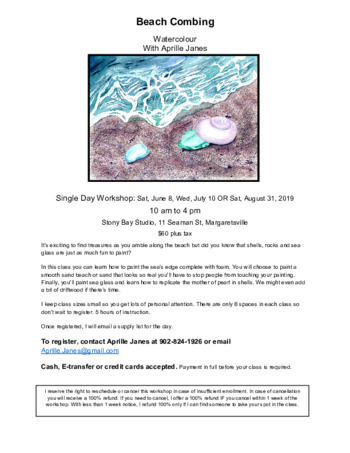 Finally, you’ll paint sea glass and learn how to replicate the mother of pearl in shells. We might even add a bit of driftwood if there’s time. I keep class sizes small so you get lots of personal attention. There are only 8 spaces in each class so don’t wait to register. 5 hours of instruction.